Sundays round of MSG was held at Brentwood’s not so secret nuclear bunker. Conditions were very hot to say the least. Series overall leader Josun Cole (JC) was on the start line along with a number of other big names in the under 12s race. H was effectively on his home ground but had never ridden the course before. Off to the start with a mass sprint to the first corner H was placed 4th on the bend. As the lap opened up JC had taken the lead with H sitting on the wheel. With a very small gap from the chasing group. As the first lap came to an end JC had broken clear from H. Back markers played their part in slowing the lead group down with a couple of close spills and H comiming off thus knocking time off. With H now in a tight chase for second place with Alex Dale it was neck and neck within the lap both taking the lead, into the final finishing line it was a very close sprint Alex held onto second spot. 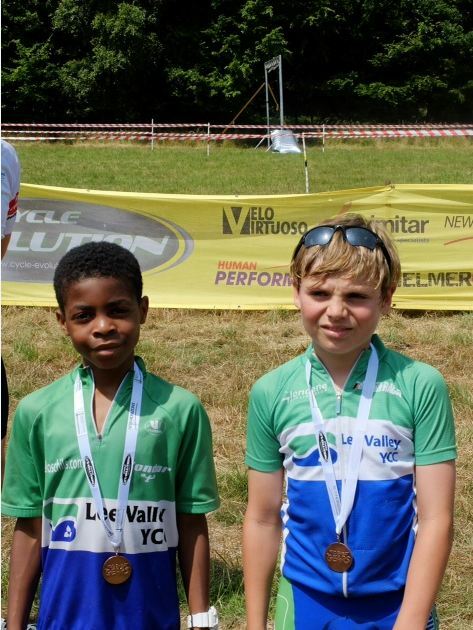 Lee Valley Youth had two other podiums on the day. Caelan Miller awarded 3rd but awaiting for a stewards enquiry.